BANGKOK, 12th February 2019 (NNT) – On Monday, soldiers from eight countries, including Thailand and the United States, constructed a school building in the northern Thai province of Tak ahead of this week’s 2019 Cobra Gold light military drills. 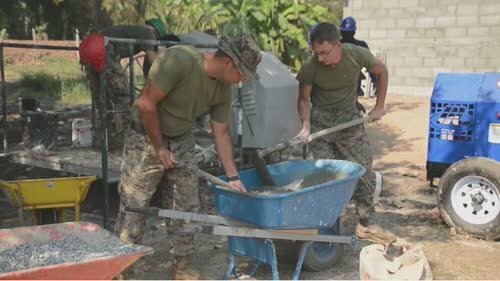 The soldiers converged on Ban Koh Ai Duan School in the capital district of Tak to build a multi-purpose facility, as part of this year’s Cobra Gold exercise. Throughout 2019, the soldiers will erect six buildings in five provinces namely Phitsanulok, Tak, Nakhon Sawan, Chanthaburi and Rayong. Involving 8,474 soldiers, the 38th iteration of Cobra Gold 2019 is taking place from February 12 to February 23, 2019. Cobra Gold is one of the largest theater security cooperation exercises in the Indo-Pacific and is an integral part of the US and Thailand’s commitment to strengthening engagement in the region. Cobra Gold will improve the capabilities of participating nations to plan and conduct combined and joint operations, build relationships among participating nations across the region and improve interoperability over a range of activities including enhancing maritime security, preventing and mitigating emerging disease threats and responding to large-scale natural disasters.